Goodreads Summary: If fate sent you an email, would you answer? You know those books that leave you with a smile on your face, that feel like they need a chorus of "Aww!" at the end, and that you just want to hug when you finish it because that book was just what you wanted it to be? That's how I felt about This Is What Happy Looks Like. Most people felt that way about The Statistical Probability of Love at First Sight, and I think it is safe to say that if you liked that book, you will love this one. "Or what this just what happened when you got older? Maybe growing up was really nothing more than growing away: from your old life, from your old self, from all those things that kept you tethered to your past." Ellie O'Neill lives a relatively quiet life in a small, coastal town in Maine. Her life is fairly routine until one day, she gets an email meant for someone else. She responds back, and just like in You've Got Mail, a conversation starts. She and her email partner talk about everything - except their real names and backgrounds. Little does Ellie know that she's been emailing Graham Larkin, one of the biggest teen Hollywood heartthrobs and someone she never expected to meet. Graham, however, is determined to meet her, and even manages to have part of his new movie shot in Ellie's Maine town. But can any relationship really work between a small-town girl with a family secret and a movie star with no privacy? Is Ellie willing to risk being in the spotlight to be with him? Sunrises over the harbor. Ice cream on a hot day. The sound of the waves down the street. The way my dog curls up next to me on the couch. Evening strolls. Great movies. Thunderstorms. A good cheeseburger. Friday. Saturday. Wednesdays, even. Sticking your toes in the water. Pajama pants. Flip-flops. Swimming. Poetry. The absence of smiley faces in an e-mail. 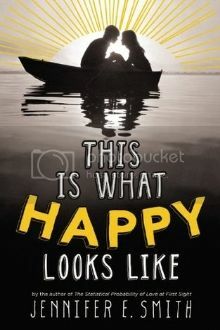 This Is What Happy Looks Like is just what I hoped it would be; all of the elements worked together to create a story that was very touching. I was hooked from the beginning with the email exchanges between Ellie and Graham. They were innocent, fun messages that progressed into something more, showing just how deeply relationships can develop when all you have are written words. As for the characters themselves, I really liked both Ellie and Graham. Ellie didn't fall under Graham's "actor" spell and was willing to sacrifice what she wanted in order to do what she believed was right. Likewise, Graham was truly a good guy. I liked seeing his hidden talents, like his artistic ability, and I liked the different portrayal of the famous actor. He wasn't perfect, but he also wasn't a jerk; he lost control, but at the same time he just wanted to be seen for him rather than for his Hollywood persona. From the start, it was obvious how these two just fit together. Yet there is more to the story than just a small-town girl going out with a celebrity. Ellie also has to confront a past that she has tried to ignore, and with that she has to work out things with her mother. There are also poetry references from Ellie that I liked, and I even want a framed poem now. Beyond that, though, there are two main things that really make this book come alive. The first is the setting, the small coastal Maine town - I could really envision it, and even found myself wanting to visit one. The small town feel was captured so well, and I loved it. But most of all I really loved the few quiet moments that happened in this book, with Graham and Ellie sitting on the coast, enjoying moments to themselves. It was a classic example of silence speaking more than words, and even though I read this book mostly in one day, I found myself wanting to savor the moments. 'They're the beginning of the night,' she said. 'That's something.'" Even after finishing this book, I've wondered how life kept going for Graham and Ellie; I closed the book, but I haven't forgotten them. The underlying possibilities for happiness in this book left me with a smile on my face. I can't wait to see what Jennifer E. Smith writes next!